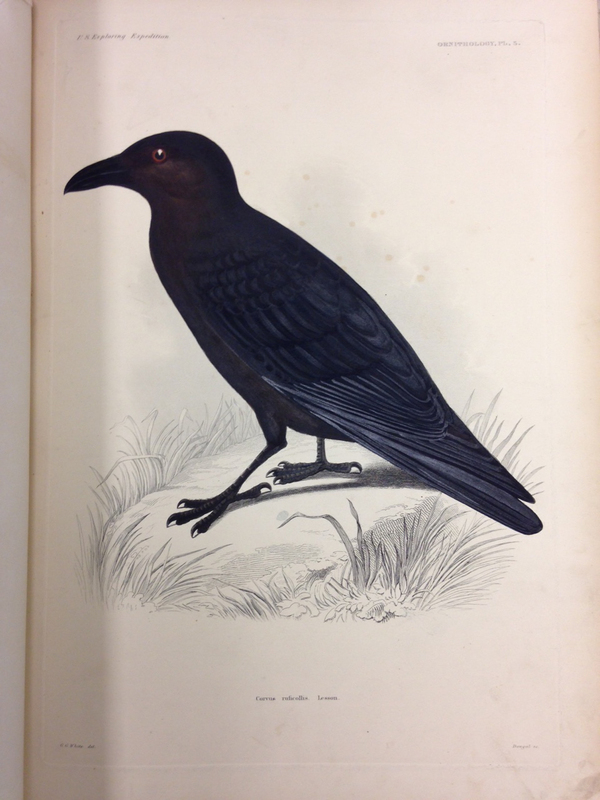 Ornithology, Plate 5: Corvus ruficollis (Brown-necked raven). – Close-up on that ever-watchful eye…No wonder Poe was wary! Mammalogy, Plate 3: 1. Lupus gigas. 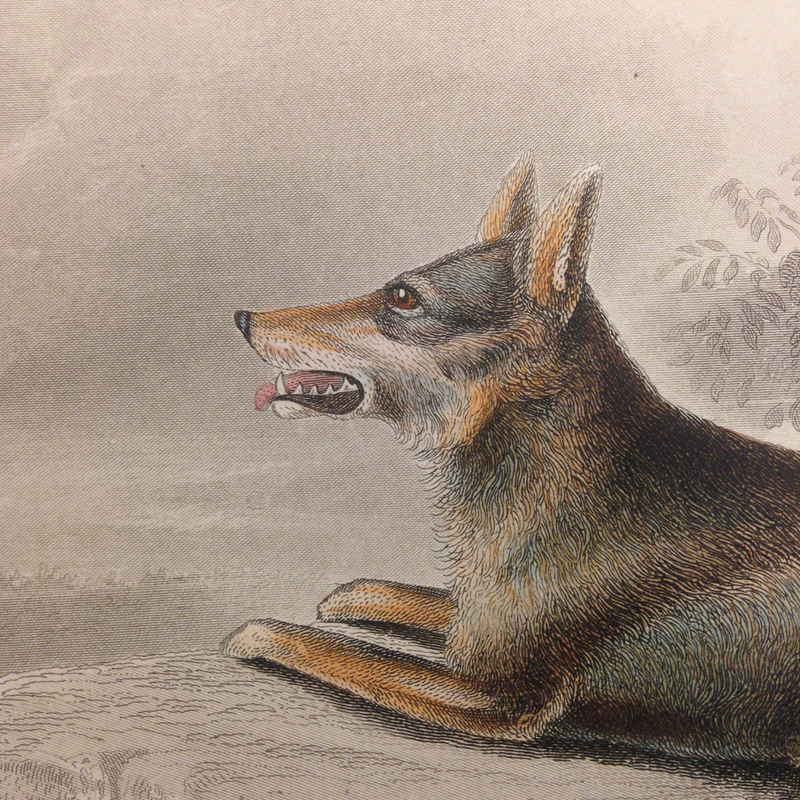 (also known as C. lupus gregoryi, Gregory’s wolf), 2. Lupus occidentalis. (Northwestern wolf). – The brown used for the eyes of these wolves has such a red hue and the teeth are so prominent that it is clear the illustrator found these wolves intimidating. Mammalogy, Plate 3: 1. 2. Lupus occidentalis. (Northwestern wolf). – Sitting around the campfire with friends, you hear the howls and growls of wolves… Grrr…. 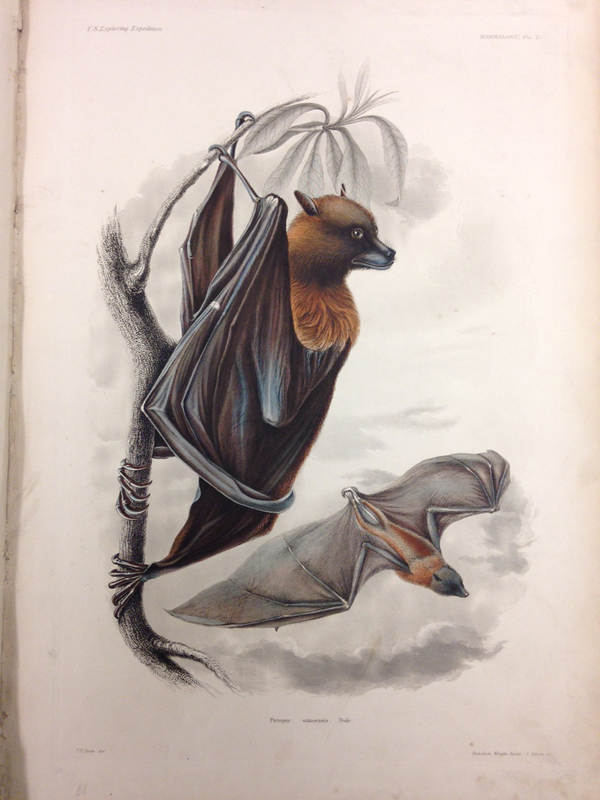 Mammalogy, Plate 2: Pteropus samoensis (Samoan Flying Fox). – They might look scary, but you can sleep easy knowing these bats are vegetarians! 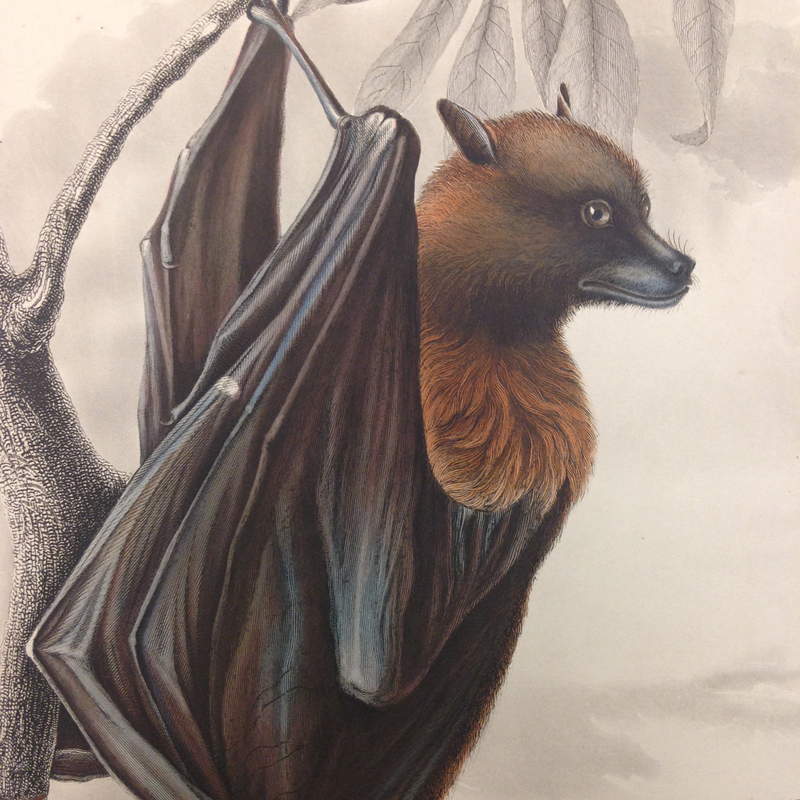 Mammalogy, Plate 2: Pteropus samoensis (Samoan Flying Fox). – Those details, though. Close observation of these plates reveals the skill and painstaking detail put into each engraved plate. 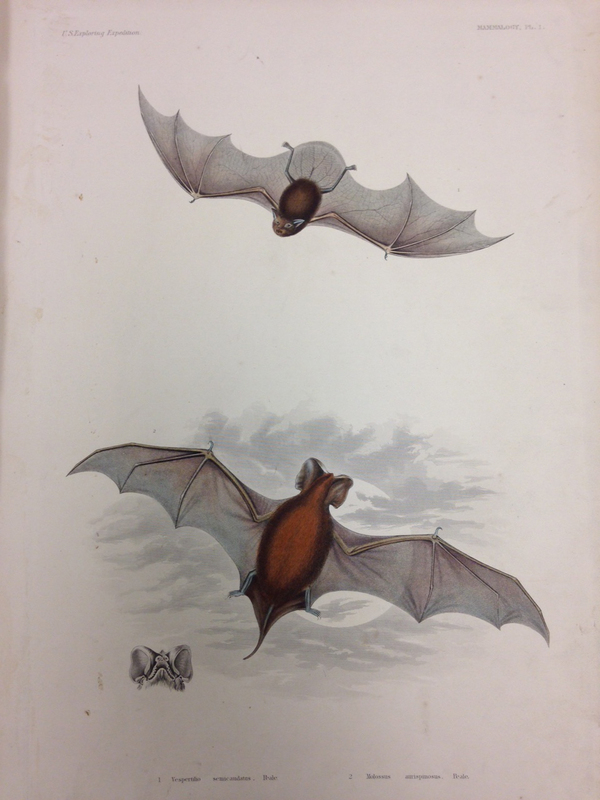 Mammalogy, Plate 1: Vespertilio semicaudatus (also known as Emballonura semicaudata semicaudata, Pacific sheath-tailed bat). – This little bat likes caves, but there appears to be no information about what they like to eat… mwahahahahaaa! 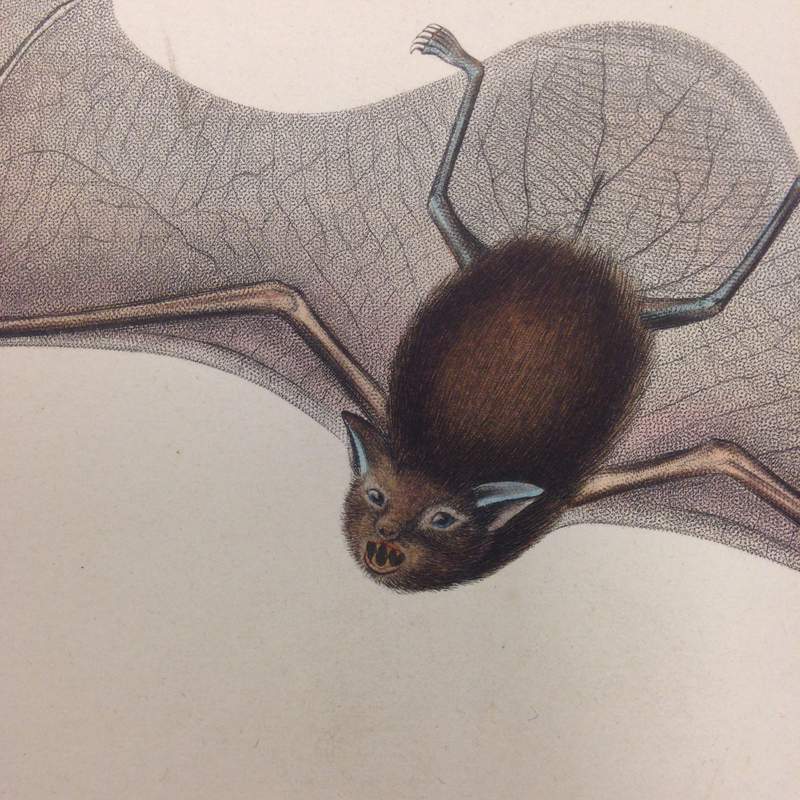 Mammalogy, Plate 1: Vespertilio semicaudatus (also known as Emballonura semicaudata semicaudata, Pacific sheath-tailed bat). – Look at those fangs… tiny instruments of carnage! 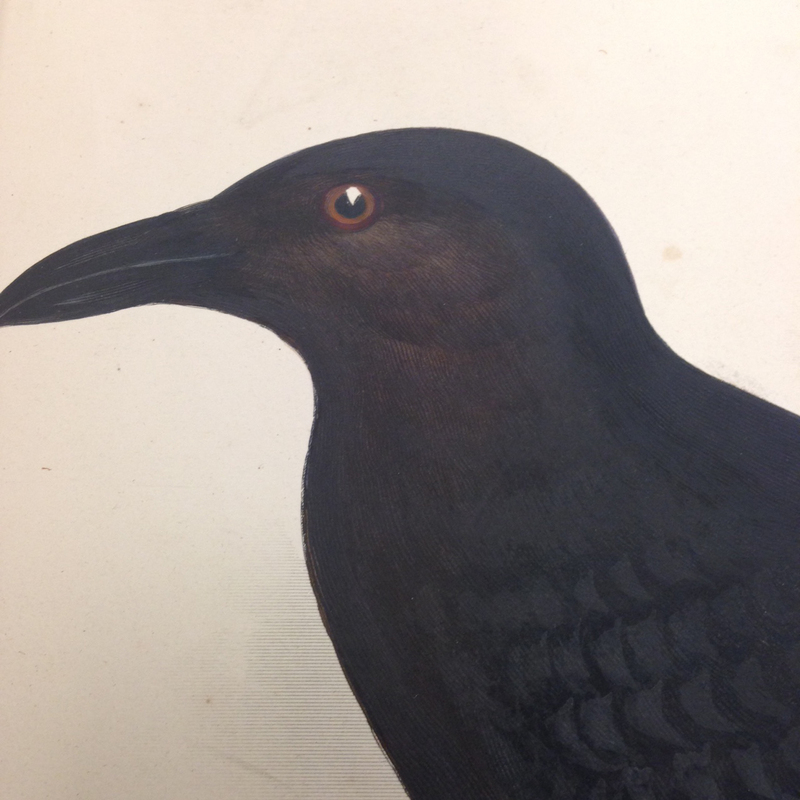 If you’re a nature lover and this volume peaks your interest, the Indiana State Library collections feature an amazing assortment of historical natural sciences books of note. This book and many other exciting volumes are available to view upon request in our reading room, so come down and have a look! 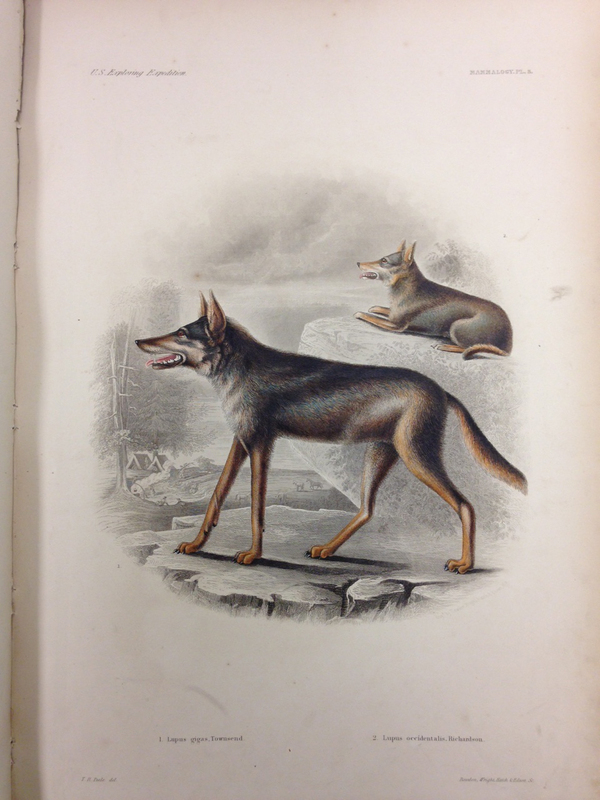 This entry was posted in Conservation and tagged Atlas, Conservation, Expedition, Exploring, Indiana State Library, Library, Martha E. Wright by indianastatelibrary. Bookmark the permalink.